• change of pants, socks, etc. Campers will enjoy the combination of fun, adventure and learning during the weekly sessions at Camp Haycroft. Our facility is located on 35 acres in the region of Vaughan, just south of King City. Although we are within the town limits, the property has all the features of the great outdoors. 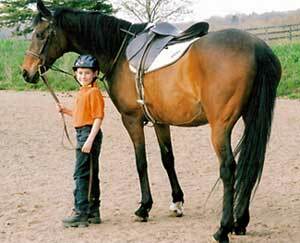 Plus modern conveniences and a professional riding program, taught by qualified adult instructors. At Camp Haycroft the kids will experience daily rides and instruction in English riding basics as well as practical horse & stable care techniques. When the kids are not riding, our instructors will conduct interactive craft classes, outdoor excursions, scavenger hunts, storytelling and many other exciting activities to amuse and educate the campers. Our programs and educational sessions achieve an optimum balance between fun and learning. Lunches, water, juices, extra socks, shoes etc. should accompany the camper daily. Friday of each week is Parent’s Day. Parents are invited to watch the children ride between 2:30 pm and 4:00pm. This is also a valuable time to support your child’s accomplishments and participate with them. Space is limited to 10 Campers per group. Each group will have a Team Leader and Assistant to monitor and direct the Campers through their activities. Please book large groups early to ensure dates are available. Want to check out some pictures of the fun we had this summer at Camp Haycroft?